Trade union renewal is high on the agenda in many countries, but we need to think carefully about why we want it. Union renewal is a profoundly political and ideological issue.We need to have a clear understanding of how we got into the current mess where many unions are bureaucratic, inefficient and struggle to respond to urgent issues. We need to think carefully about what we want to achieve, not just in terms of how we organise – but what we aim at in the long run. We need to have some theory about what unions can be, and should be . If we have to ask the question of why we should revitalise or expand unions, we have to decide what we want from unions in the first place. We also need to tackle the issues of the relationship between unions and political parties – and whether workers and unions benefit from workers’ parties that aim at state power. Speaking of union ‘renewal’ often assumes we had a working model in the past, and that there is one specific way unions can and should work. But what we can and should achieve is not obvious.It’s not a simple technical question about which structures work. It’s not a simple question of democratising unions.What is the aim of having a well-organised or democratic union in the first place? There are many choices to be made, even if we have democratic unions. Should unions be business unions, basically dealing with wages and conditions? Or run by experts as service organisations, similar to insurance firms? Or be aiming at something more? The reality is that unions are always intrinsically political. Their very existence raises questions around power, around class, and around identity and how we build it. Unions are never neutral. Even if when a union calls itself non­-political, that is itself a politicai position, based on a theory. Unions emerge as a response to a system that is intrinsically unable to satisfy the needs of the great majority of the working class.They provide a key place for solidarity among ordinary people in a very alienating society. Unions are not disappearing, and neither is the working class. Other than faith­-based organisations, trade unions are the largest and most resilient popular organisations. People speak of a crisis of unionism, but we need to be careful about how we measure that. There is no proper database of unionism worldwide, but every indication is that unions, overall, remain quite stable in terms of numbers, and viewed globally, are even expanding. This reflects the fact that proletarianisation is accelerating: despite certain fashionable theories, class is not gone; class divides are deepening, the working dass – those dependent on wages but lacking control -is now the biggest class on earth. Unions persist precisely because capitalism and the state are simply unable to incorporate or co-opt the working class. Their very existence reflects the fact that society is riven with deep, stark contradictions. Even the most undemocratic, politically problematic union can only survive to the extent that it represents workers’ interests, no matter how limited a way, and the reality of irreconcilable class antagonisms. What can a union be? None of this invalidates arguments that unions have often been undemocratic or sectional in that they reflect and even reinforce divisions between workers -by union, by skill, by industry, by country, between employed and unemployed, and between different federations -or often ended up dealing only with immediate issues around wages rather than the larger challenges in society. But the question is: is this inevitable? Pessimistic approaches think so, e.g. Robert Michels’ iron law of oligarchy’, in which all mass movements get captured by small full-time self-seeking leaderships. He believed union democracy would die as unions developed.V.I. Lenin believed that unions were sectional, reflecting and reinforcing divisions between workers. Arguing that unions were normally stuck at the level of dealing with immediate issues like wages: they bargained over the terms of exploitation, rather than ended it.They focused on reforms -reformism -and ‘economistic’ concerns. That full­time union bureaucracies emerged to run the bargaining and held back anything -including workers -that threatened it. But this is all very one-sided, as a more ‘optimistic’ analysis shows. There are many examples of union bureaucracies being challenged from below, especially through rank-and-file movements of ordinary members.The whole notion of union renewal assumes precisely that such challenge and reform is possible.There is no link between union size and levels of democracy: some of the most democratic unions in South Africa in the 1980s were massive unions like those in the so-called ‘workerist’ Federation of SA Trade Unions (FOSATU) movement, and some of the least democratic were small conservative business unions.And unions have repeatedly proved to be key sites of class consciousness and radical politics. And, moving beyond the ‘optimistic’ analysis, to an anarchist/ syndicalist analysis, it is also possible to show many examples of mass unions that have maintained democratic systems, the best being the anarcho-syndicalist Confederación Nacional del Trabajo (CNT) in Spain. This was a radical union that, in the 1930s, came close to two million members, yet rested on a very decentralised structure and had a tiny full-time staff. It systematically overcame sectional divisions among workers, participated in land, community and youth struggles, and opposed colonialism. Contrary to Lenin’s view that unions, left to themselves, were inevitably stuck at the level of so-called ‘trade union consciousness; the CNT systematically promoted revolutionary ideas and actions, organised a workers’ army, and, in 1936, helped place most of the land and industry in Spain under the direct control of ordinary people, changing daily life and creating a working-class democracy. So what Michels and Lenin were talking about were tendencies -but they ignored the counter-tendencies for democracy, and the obvious evidence that unions could achieve revolutionary changes without party tutelage or state support. Michels’ so-called ‘iron law’ rests on the assumption that top­down centralisation and full-time bureaucracy are the most efficient, technically necessary, inevitable measures available, and that oligarchies emerge from this process. The same idea is present in studies that suggest that unions ‘mature’ over time, becoming more moderate, professionalised and conservative. But undemocratic, top-down unions, run by officials, are actually very ineffective, and often fairly lifeless. They struggle to respond to changes, they place the interests of the officials over the interests of their members, and their leaders are prone to co-optation by governments, businesses and political parties. That is precisely what the current push for union renewal shows: the future of unions lies in unions becoming more democratic, more member-driven, more decentralised and more flexible. The argument for centralism and bureaucracy is an ideological one, a deliberate choice (as the CNT’s counter-example shows) that arises from a false theory, reinforced by the destruction of democratic checks-­and-balances, the immersion of union leaderships in political parties and states, and the ‘Moses syndrome’: the idea that the masses need to be led by a few great leaders, and the ambitions of those who hope to become the Moses. An economistic and reformist unionism is always better than no unionism at all. Of course bargaining around wages and rights is valuable, and there is not much else, besides unions, that has succeeded in these roles. But it deals with the symptoms of, and it simply responds to, what the capitalist system and the state do. And since the problems facing the global working class – unemployment, poverty, low wages, insecurity, racism, war, gender oppression and so on – are deeply linked to capitalism and the state, real change means tackling the system itself. If you have headaches all the time, it’s not a good idea to live on headache pills; you need to find out what is wrong and get a cure. Capitalist corporations and the state apparatus are extractive systems that centralise power and wealth in the hands of small elites, are profoundly undemocratic, produce and distribute for profit and power, are prone to instability, and marked by war, imperialism and hatred. Removing poverty and inequality, and ending class exploitation, requires their negation by placing productive resources and real control in the hands of ordinary people -a bottom-up society based on participatory planning, common onwership, global community and distribution by need. So, if unions emerge as part of the class struggle, reflect class divisions, and can certainly (as the CNT showed) make radical changes in society, can they help develop the cure that society needs? And if so, how? And what would that cure entail? The dismissal of unions by many self-described radicals today is not shared by the ruling classes: the bosses and politicians.They are well aware that unions can make dramatic, revolutionary changes. This is precisely why labour law is designed to contain unions, limit their scope and activities, and tie them into lengthy official procedures -and why every effort is made to weaken, corrupt and destroy unions. Lenin, too, never denied that unions could play a role in a transition to socialism. His argument was, rather, that unions could become revolutionary, only if led by a revolutionary workers party aiming at state power. But this vanguardist politics -the party first, the union as ‘transmission belt’ for party instructions -still rested on a profound underestimation of the potential of unions. It also rested upon a fatal overestimation of the value of so-called workers parties. Subordination to a party that aims at state power political unionism – centralises unions, replaces workers’ control of the unions with party control; it leaves politics and transformation to the party; rather than overcome reformism and economism, it inevitably promotes it. The history of workers’ political parties, whether reformist labour parties, or revolutionary communist parties, and of nationalist parties, as forces for popular emancipation, is absolutely dismal. Rather than bring workers to power, they have repeatedly betrayed, broken, corrupted, divided and repressed workers’ movements like unions. The fall of the African National Congress (ANC) is nothing exceptional. The problem is not that these parties have the wrong programme, or bad leaders – as those who insist on trying to rerun the failed project also claim -but the fact that transformation by the immense majority in the interests of the immense majority cannot come through the state. The state is a centralised, undemocratic structure that entrenches minority class rule; rather than change the state, the parties are changed by the state, their leaders co-opted into the ruling class and its agendas. Simply put: elections and dictators are not the solution. Unions can certainly contribute to a new, better society in which there is a massive redistribution of power and wealth to the popular classes, including the workers and the poor. But as Lenin’s Bolshevik Revolution in 1917-where a labour-repressive dictatorial Tsarist regime was simply replaced with a labour-repressive dictatorial Marxist regime -shows, real change must take place in a way that does not just replace one elite with another. This means rejecting the party form and the capture of state power, in favour of mass movements that can transfer power directly to the people. Bottom-up participatory trade unions are the most efficient, the most creative, the most innovative and the most responsive types of union. We need to move from the idea that unions must be centralised, and also from the idea that unions’ future lies in servicing members. A radical union movement of this sort defends its members, and fights for daily improvements. lt’s a participative model where the members are the union, not customers, and where union leadership is essentially about facilitating a bottom-up unionism. The important thing is accumulating organisational power and promoting popular consciousness to contribute to a society where ordinary people are in charge. But they can also prefigure and then help create a radical change in society, by developing the ideas and structures that can lay the basis for a new social order. To place power and wealth in the hands of ordinary people requires, not a state, not a party, but a system of worker and community assemblies and councils in a self­managed, egalitarian order based on participatory planning, common ownership and distribution by need. This was precisely what was shown in the Spanish revolution by the CNT. 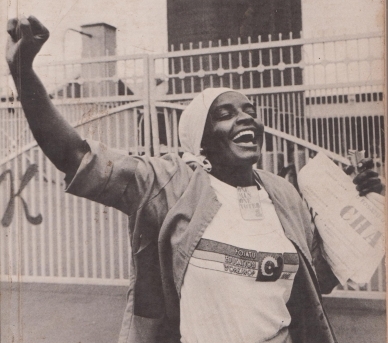 After decades of failed land reform, corrupt government, chasms of poverty and inequality, and the failure of the parties, the CNT – with its popular allies, and providing direction to rival unions – undertook one of the most profound revolutions in history. And the bottom-up CNT structures formed the core of the new society. We need to move beyond the idea that unions are just needed in conflicts, to thinking about how unions can provide a space for collective action, class identity, unity across divides of race, ethnicity, and country, and self-activity. The core of a counter-hegemonic project is the development of popular capacities and escalating demands. This requires creativity and innovation. There is no reason why union investment funds cannot be redirected into organising drives, an alternative mass media, and the basis of union-run clinics, recreational facilities and schools. Along with this is the need for much more branch control of union funds. This is not a crude workerism, but a revolutionary class politics that is solidarity based, egalitarian, is anti-racist, anti-colonial, anti-sexist ­opposed to all forms of oppression. Not a party-led political unionism, but a profoundly revolutionary unionism. It means taking a lead in fighting against oppression, for the emancipation of women, against war and empire, and for freedom for all. This is not new: it’s the core of old left traditions like anarcho­syndicalism. Many challenges unions face are linked to capitalist restructuring, but we need to also be very clear about states. Unionists commonly speak of capitalism as the main problem, but it’s not the only one unions face. lt is clear from African and Latin American experiences that states wreak havoc. They are the largest employers and they actively aim to capture union leaderships. Rather than corporatist bodies and parties in government helping unions, these enable the state to exert control over unions. In place of parties, it makes more sense for unions to be part of a revolutionary front of the oppressed classes, based on community, youth and other formations, aiming at deep change, and to also expand beyond traditional constituencies into organising the unemployed and so-called self-employed. The muscle of unions at the point of production can aid the rest of the front, and the front can aid unions through, for example, consumer boycotts. All of this requires serious reform in the unions – reform that will inevitably be resisted by parts of the union bureaucracy, and definitely by the political parties. It must, therefore, rest upon a rank-and-file movement to change the unions from below -a movement in all the unions -into part of a working class counter-power, armed with clear ideas and a programme. ** Source: Lucien van der Walt, 2018, “From Union Renewal to a Self-Managed Society: Towards an anarcho-syndicalist project,” South African Labour Bulletin, volume 42, number 1, pp. 27-30.